This Sauternes-style wine is a classic expression of a Botrytised late-harvest wine, containing 100% Sémillon. The grapes are from the Herrick Vineyard at the northern end of the Russian River Valley appellation. Cool, foggy nights followed by the warm sun during the day makes an ideal environment for the "Noble Rot" Botrytis to grow and provide that concentration of flavors and complexity that a great Sauternes exhibits. 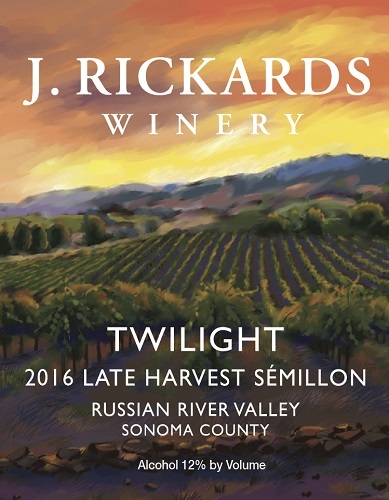 Our 2016 Twilight offers a bright bouquet of honey and stone fruit blossoms, leading directly to round flavors of ripe peach and summer melon. It is truly worthy of that most magical time of day after which it is named.